Convinced before the onset of Operation "Barbarossa" in June 1941 of both the ease, with which the Red Army would be defeated and the likelihood that the Soviet Union would collapse, the Nazi regime envisaged a radical and far-reaching occupation policy which would result in the political, economic and racial reorganization of the occupied Soviet territories and bring about the deaths of 'x million people' through a conscious policy of starvation. 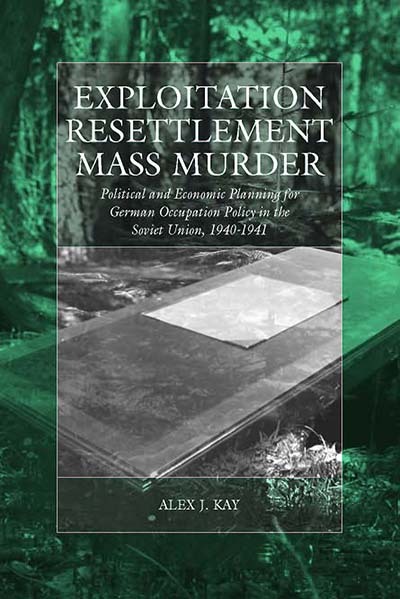 This study traces the step-by-step development of high-level planning for the occupation policy in the Soviet territories over a twelve-month period and establishes the extent to which the various political and economic plans were compatible. Alex J. Kay graduated from the Universities of Huddersfield and Sheffield in the UK and received his PhD from Humboldt University, Berlin, in 2005. The following year he received the Journal of Contemporary History's George L. Mosse Prize. Since 2014 he has been Senior Academic Project Coordinator at the Institute of Contemporary History Munich–Berlin. Dr Kay is author of The Making of an SS Killer: The Life of Colonel Alfred Filbert, 1905–1990 (2016), and co-editor of Nazi Policy on the Eastern Front, 1941: Total War, Genocide, and Radicalization (2012). The Fate of the Soviet Jews: Pre-invasion Order for Genocide? Soviet Labour: Deployment in the Reich?